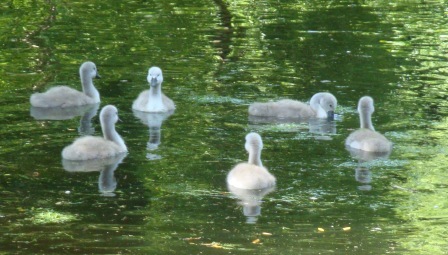 There are many terms for a group of swans and I didn’t exactly find ‘bumper crop’ among them, but that’s what I thought when I saw this adorable family in St. Stephen’s Green. The sun has been shining all day all week – a rarity in Ireland, and the crowds were out in force in the park. Plenty of families with children were admiring their wildlife counterparts. Normally wound-up, chock-full-of-energy children sat still on the ground, enthralled by the sight of the family preening themselves on dry land as the little ones prepared for their late afternoon nap. All (web) feet on deck! “Yes, there are eight,” I replied as she was relatively close to me. “Yesterday there were nine,” she informed me in a German accent. “Must have been the foxes,” she added as she turned to leave. For the record, herd, bevy, game and team are some of the terms that describe a group of swans. Another, that seems apropos with the loss of one of the children is lamentation. That wasn’t the only entertainment going on in the park that day. 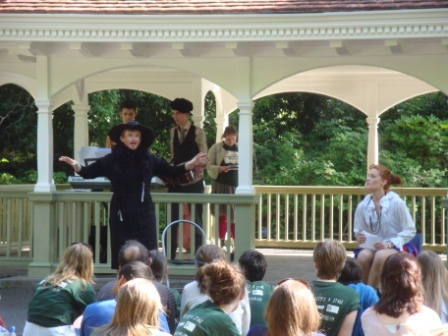 A group of Shakesperean-ish actors were performing some snippets of plays on the opposite side of the pond. No shortage of spectators lounged in the sun on the grass, watching the performance. I only lingered a few minutes – the traffic noise seemed to be drowning out much of their words. Hopefully they will work on their projection as they hone their talent. 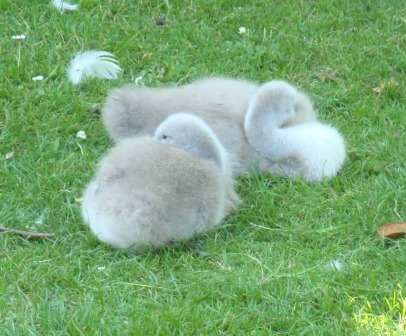 I hope you will show us the swans when we come for a visit on the 23rd. Can hardly wait!! I would love to! Looking forward to seeing you all.